On Monday, January 14 professional kimono stylist and owner of the kimono-dressing company Kimono Experience (as well as my personal Japanese teacher) Emi Kikuchi presented a kimono show at Queens Library in Flushing. 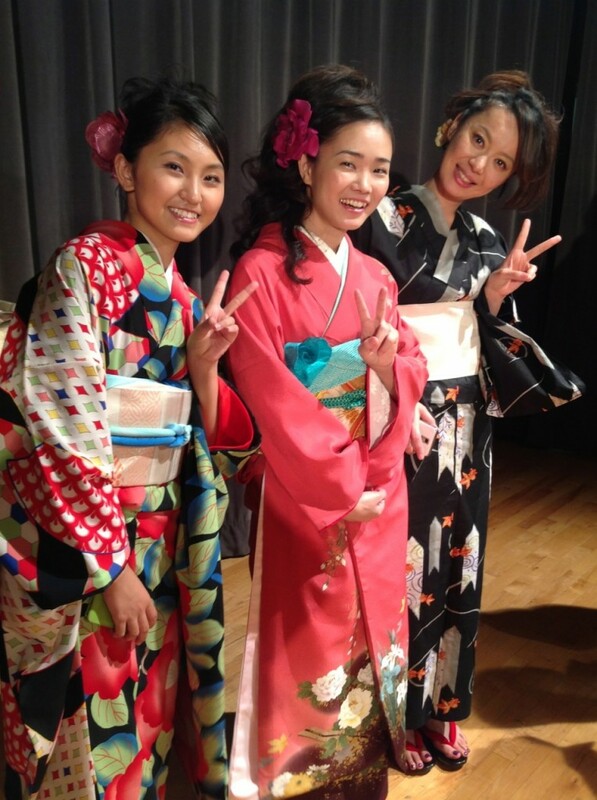 I served as the emcee of Japanese Kimono Fashion Show – Occasion and Style, a one-hour program that introduced different kimono styles and the occasions at which they are worn. The Japanese have been wearing Western-style clothing for more than 100 years, but the skill, craftsmanship, and beauty of kimono are still important facets of Japanese culture. 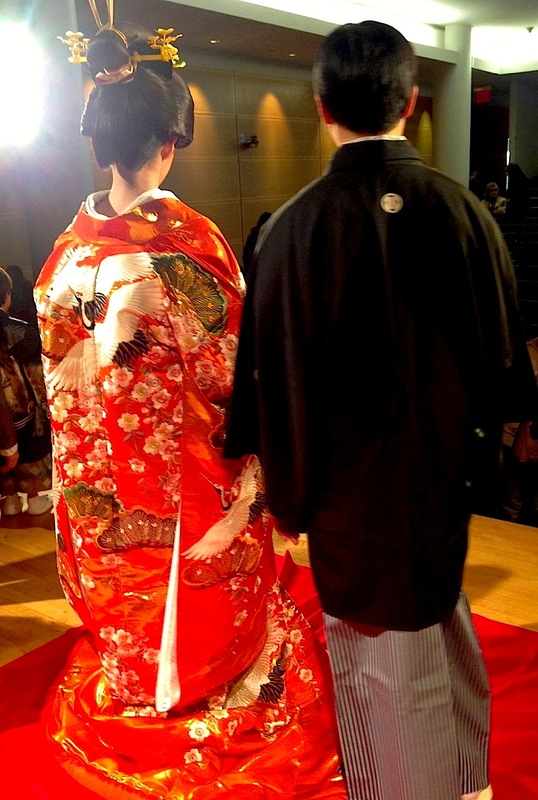 The kimono fashion show described several uniquely Japanese ceremonies to which kimono are still worn, such as the first visit to a Shinto shrine or a Buddhist temple to welcome the New Year (Hatsumoude), Coming of Age Day (Seijin no Hi), and summer festivals (Natsu Matsuri). (L-R) Mako Ito, Azumi Tsutsui, and Mayu Hayashi. Ito and Tstutsui are modeling Furisode kimono worn on Coming of Age Day, while Hayashi is wearing a yukata for Natsu Matsuri. The crowd seemed especially delighted to see the young children in their kimono for Shichi-Go-San, a special occasion celebrating girls ages seven and three and five-year-old boys. 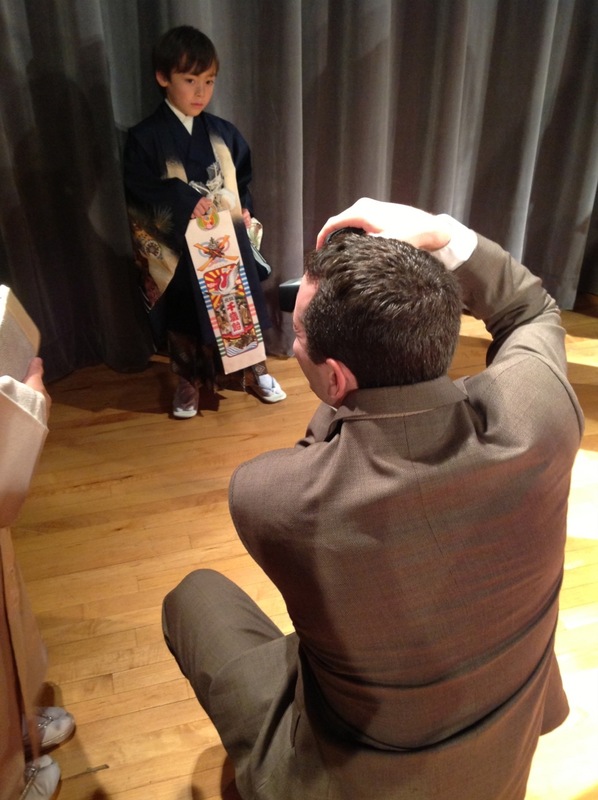 Russell Stram takes a photo of his son, Noah, who is wearing traditional kimono for Shichi-Go-San. 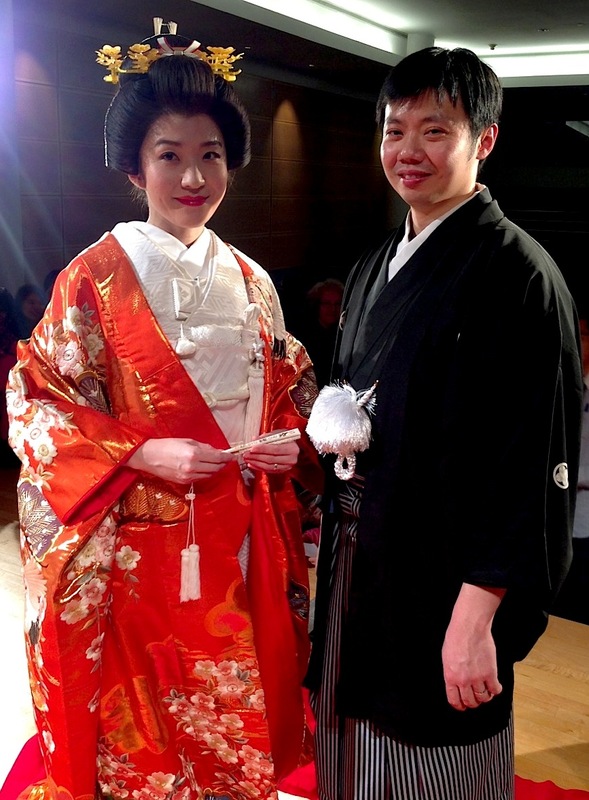 The highlight of the evening was the Japanese traditional wedding kimono, modeled by real-life husband and wife Julius and Akiko Kwan. Akiko and Julius Kwan model bridal kimono worn at a traditional Japanese Shinto wedding ceremony. The elaborate detail of the wedding gown. Also part of the program was a look at kimono worn in the traditional Japanese arts. Kansuke, who runs a workshop teaching Kyogen, one of the oldest forms of Japanese theater, performed onstage with three of his students. They will be part of a Japan Earthquake and Hurricane Sandy benefit concert at Carnegie Hall on February 26. 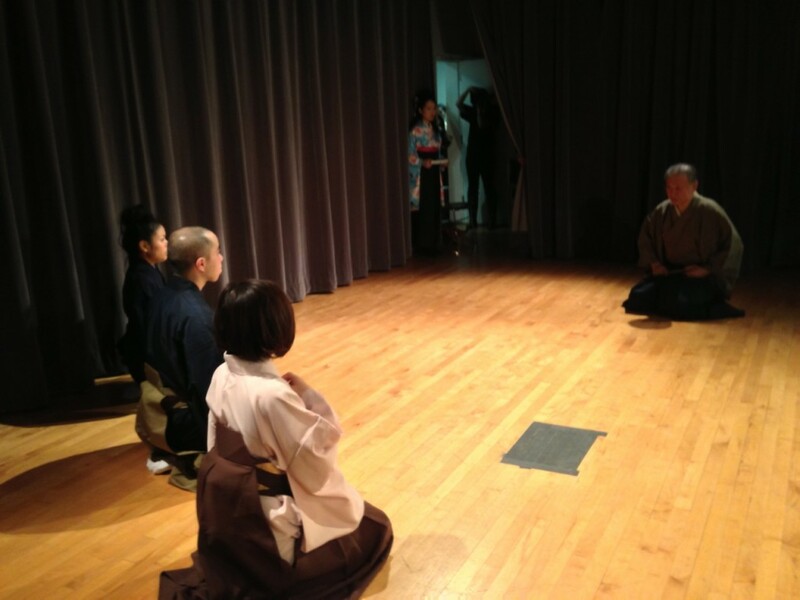 Kansuke (far right) and his students Saori Goda, Akira Ito, and Akane Yuki, rehearse their Kyogen performance before the show. 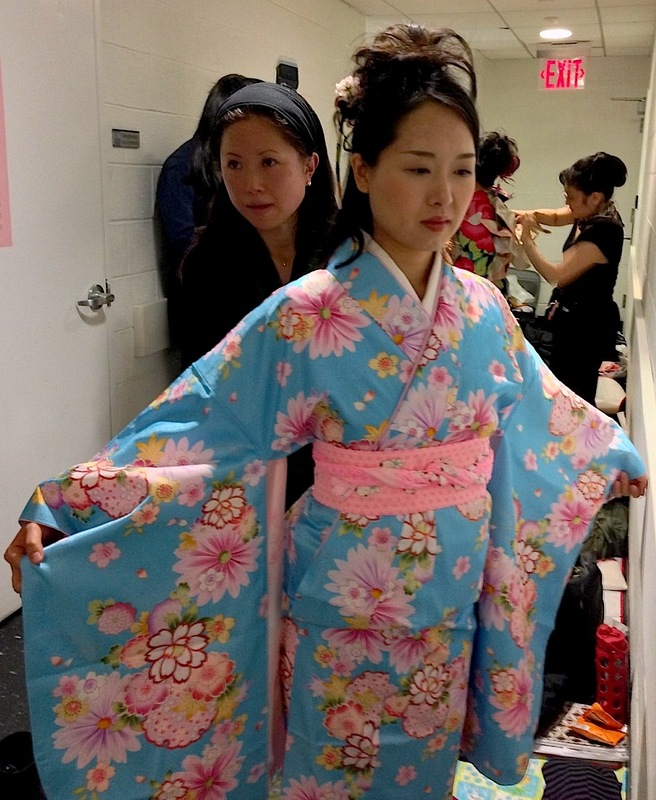 Behind the scenes, a group of professional hair stylists, makeup artists, and kimono dressers worked efficiently with Kikuchi and Sonoko Kawahara, a theatrical director and co-founder of the multi-disciplinary theater company Crossing Jamaica Avenue. Emi Kikuchi (far left) ties Mako Ito’s obi (sash). Professional kimono stylist Yukiko Sato dresses Tomoko Fujita in a Furisode kimono worn to Sotsugyo, a Japanese graduation ceremony.